Bilderberger George Osborne appointed Mark Carney (Freemason, Goldman Sachs, Bilderberger) to be governor of the Bank of England. Can you believe this man? As a senior cog in the Bank that co-ordinated, mastered and milked the sub-prime debacle of lending money to unworthy risk borrowers, then fed off the QE process, he is now telling the lenders (while interest rates are still rock bottom) that they are lending too much…..
Ultra low interest rates could damage the economy by encouraging excessive household borrowing, Mark Carney admitted last night. The Governor of the Bank of England also said he is ‘fully aware’ the policy is not without considerable risks, putting ‘a tremendous burden’ on the Bank as it battles to restore the economy to health. Speaking at the Mais Lecture in the Cass Business School in London, Mr Carney warned: ‘An environment of relatively low and predictable interest rates could encourage excessive risk taking in financial markets and by households. In a speech delivered at the Liverpool John Moores University on Monday, Bank of England head, and former Goldman partner, Mark Carney defended his central bank’s near-zero borrowing costs which have been increasingly criticized by local politicians ever since the Brexit vote, claiming that central bank monetary policies have not been the cause behind wealth transfer. Thanks to the just released February diary of Fed chief Yellen, we now know exactly when she called Bank of England Governor (and former Goldman Sachs employee) Marc Carney and ECB President (and former Goldman Sachs employee) Mario Draghi. And now a special challenge for Zero Hedge readers: spot the number of lies uttered by the advisor in the text above. We exclude his repeat denials of the “conspiracy theories” – those don’t count. In other words, please welcome the UK to the global currency wars. In this episode, Max Keiser and Stacy Herbert investigate the black hole of debt sucking in our economies, jobs and wealth like strings of spaghetti past the economic event horizon. In the second half, Max Keiser talks to Ned Naylor-Leyland of Cheviot Asset Management about the fishy smoke signals blowing at the LBMA regarding silver contracts and about the debate between inflation, deflation, hyperinflation actually being a debate about the final denouement of paper currencies. Ned also reveals that BBC’s flagship programme, Panorama, had interviewed him and Andrew Maguire about silver manipulation and yet have never aired the episode. 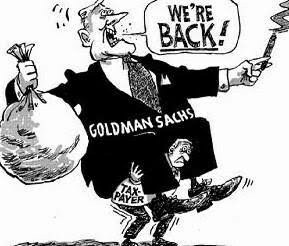 The greater story behind Mark Carney’s appointment to the Bank of England may be the completion of Goldman Sachs’ multi-tentacled takeover of the European regulatory and central banking system. But let’s take a moment to look at the mess he is leaving behind in Canada, the home of moose, maple syrup, Jean Poutine and now colossal housing bubbles. George Osborne (who as I noted last month wants more big banks in Britain) might have recruited Carney on the basis of his “success” in Canada. But in reality he is just another Greenspan — a bubble-maker and reinflationist happy to pump the banking sector full of loose money and call it “prosperity” before the irrational exuberance runs dry, and the bubble inevitably bursts.